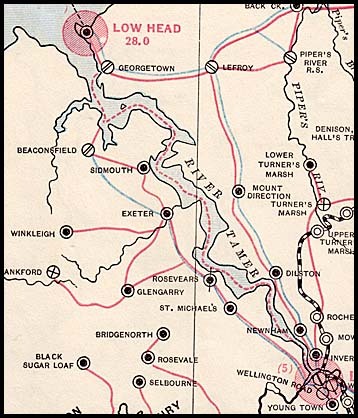 Telegraph lines in the north-west region. There was a pause in line construction after the first Hobart-Launceston line, with its extensions, had been completed in 1857. During the intervening years to 1872, the cable experiments had been implemented and telegraphic connections with Victoria were by then well established. to support the mining of the newly discovered mineral deposits. Devonport to Montagu (Cape Grim). 1. The West Tamar lines. A line was constructed to the north-west from Launceston west of the Tamar River - and so in no way duplicated the original line to Low Head. It ran north through Exeter to Beaconsfield. Although gold had been discovered at Brandy Creek (Beaconsfield) in 1847, the top of the rich gold reef was not discovered until 1877. At that time, the small town was known as Brandy Creek because of the colour of the water in the creek where gold had originally been discovered. It was renamed Beaconsfield in 1879 after Lord Beaconsfield (possibly better known as Benjamin Disraeli, Prime Minister of the UK). Underground mining began in that year and, by 1881, 53 companies were operating in the area. Clearly there was a significant need for telegraphic communication and a motion had been placed on Notice in the House of Assembly as early as 4 June 1879 by Mr. Audley Coote to ask the Minister of Lands and Works "whether it was the intention of the Government to at once commence to construct a telegraph line between Launceston and Beaconsfield". A Telegraph Office was finally opened in 1881. BEACONSFIELD, May 7. I am desired by the inhabitants of Beaconsfield to express their great pleasure at being able to communicate by wire with your borough, and they sincerely hope it may tend to develop the resources of this the most important and progressive mining district in Tasmania. They are also gratified to find that the Parliament of the colony is beginning to acknowledge the importance of the George Town district, and there can be no doubt that the colony is receiving a more lasting benefit from the mines now being developed at Beaconsfield, Lefroy, Back Creek and Gladstone, than any other industry in the colony. The whole of these places are in the district, and should therefore be connected by wire as speedily as possible. BEACONSFIELD, May 7. Captain Audley Coote, our member, and his lady are with us at the opening of our Telegraph Office. The captain takes a great interest in mining, and we are pleased to have such a man in the House. The Tasmania mine shows well for a large return this month, and we have plenty of stone to last for years to come. Now that we can send you up a wire, you shall have quick news for your paper". Launceston - Burnie - Devonport lines. 2. The Launceston - Deloraine line. In 1872, the Launceston & Western Railway lines in this region of Tasmania were also approaching completion. As described elsewhere, this railway line went south from Launceston to Evandale before running west to Deloraine. Seven railway stations were opened - at Launceston, Evandale, Perth, Longford, Westbury, Exton and Deloraine. The stations on the Launceston & Western Railway line used their own railway telegraph lines but also made them available to the public. Each of the towns were important albeit for very different reasons. For example, by the mid-1800's Westbury had become the largest military community in Tasmania while Evandale also had a major military contingent. 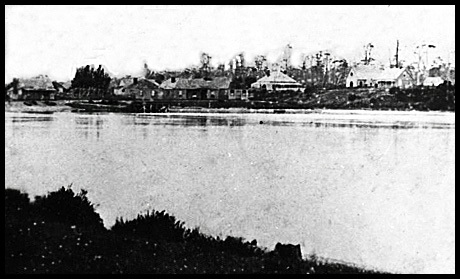 Deloraine was regarded as the gateway to the north-west of the Colony. Hence the Telegraph Department deemed it essential to construct its own Launceston to Deloraine telegraph line starting in 1871 or 1872. Work progressed slowly. It appears that the line closely followed the L&WR line. "NEW TELEGRAPH STATION. It will be seen by our Hobart telegram that the authorities have decided on establishing a telegraph office at Westbury township in addition to the one at the Railway Station in order to obviate the inconvenience to the public of having to travel a mile or so from the township to the latter place whenever any telegraphic business has to be transacted. This is a step in the right direction and it is to be commended; but another and similar instance of hardship waits still to be remedied in the case of Evandale, the telegraph office for which, being at the railway junction, is fully two miles away from the township, thus rendering the wire almost useless to the residents of that place". Although Deloraine was the centre of significant agricultural activity run by new settlers, the residents had to wait until 1885 for a new Post & Telegraph office to be opened. Tenders were called to close on 30 April 1874 for the construction of a telegraph line from Deloraine south-west to Chudleigh. "The men engaged during the last few weeks in the erection of a new line or telegraph posts between Cresy and Longford completed their work today - the last post being elevated at the corner of Marlborough and Mialcombe Sreets. I understand that th wire has been transferred fromthe old to the new supports and that the firmer have all been "axed" and laid low. It nowonly remains for the Hon. Member for Cressy to put the finishing touch on by inviting his constituents to a coffee supper in honour of the event". In 1873, telegraph lines began to be constructed from the Launceston-Deloraine line, first to Latrobe and then on to Devonport which at that time was composed of the settlements at Torquay and Formby (on either side of the Mersey River) and at Don. From the early 1870s, Torquay was established as a major shipping port. It was situated on the west side of the Mersey River with Formby on the east bank. After the river mouth was widened, regular steamer services connected the Mersey with Melbourne. Torquay and Formby merged to become Devonport after a popular vote in 1890. The construction of the telegraph line to Torquay was therefore important to support the commercial activity. The line construction in 1873 therefore enabled the opening of Telegraph Offices in 1874 at Latrobe and Torquay and then at Forth and Leven (which had a change of name to Ulverstone in 1881). The main street of Formby about the mid-1870s. The Telegraph line must have just been erected because two (perhaps three) telegraph poles can be seen in the centre and towards the left. Torquay (on the east side of the River Mersey) about 1870. In 1878, for reasons not recorded, a number of Telegraph Offices were opened in close proximity to each other west of Evandale. These Offices included Bishopsbourne, Carrick and Cressy. An office was also opened just to the west of Deloraine at Chudleigh. In 1881 a line was constructed from Latrobe back down to Sheffield. A motion requesting this line to be constructed had been placed on Notice in the House of Assembly but withdrawn on 4 June 1879 when it was announced that "His Excellency will be pleased to recommend the appropriation of a sum not exceeding £200 (two hundred pounds) for the purpose of constructing a Telegraph line to Sheffield. The Minister of Lands promised that the matter should be considered by the Government during the recess with other works that would have to be in their scheme for the next year". Intermediate offices were constructed along this line in 1899 at Barrington, Lower Barrington and at Nook. Settlement in the West Tamar region increased in the 1880s with the establishment of towns such as Harford and Frankford. A line from Exeter was later constructed through these these towns to Latrobe. In 1900, the telegraph/telephone line was extended east 20 km from Devonport through Wesley Vale and Moriaty Road towards Port Sorrell. A link south-east to Sassafras was also made in 1900. Devonport to Burnie and Circular Head to Montagu (Cape Grim). 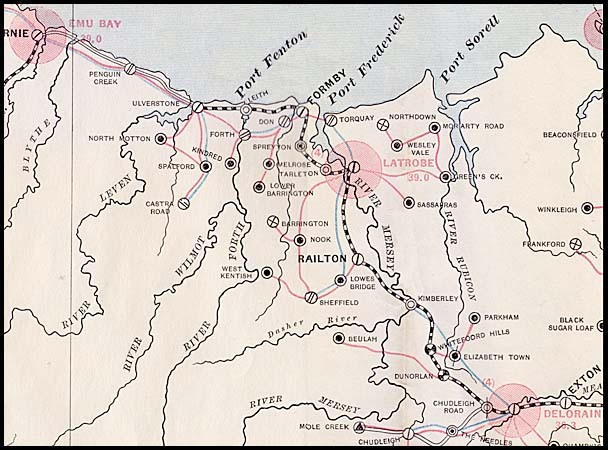 The construction of telegraph lines along the coast was continued immediately after the Latrobe line reached Devonport. 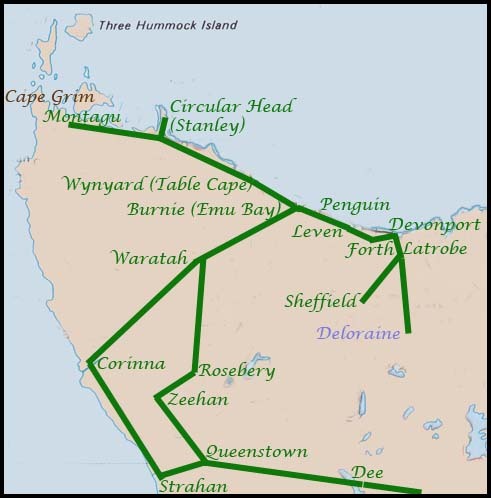 A new line was also constructed to Penguin (east of Burnie). The Stanley connection was important because it enabled distant communication to be obtained with the region - the cable to Victoria no longer operating from Stanley (and it would not until the telephone cable was laid in 1936). From Stanley, the lines were also extended to Duck River (now Smithton) and to Montagu - the most distant town in the network. In 1871, tin was discovered at Mount Bischoff near Waratah by James Smith and his assistant Shawn Bischoff. In 1873, Smith sold his interest to the Mount Bischoff Tin Mining Company. Tin prospectors looked for their fortunes across the north-west in Tasmania's mountainous region. That led to initial attempts to link the West Coast of Tasmania to more settled areas. One of the first attempts commenced in the 1870s when the Van Diemen's Land Company engaged John C. Climie to undertake a survey of a railway line from near Emu Bay (Burnie) to Mount Bischoff. Large-scale mining began in 1873 at Mount Bischoff. That was the beginning of a mining era which was to save the Colony and take Tasmania out of its severe financial crisis. A Post and Telegraph Office was opened at Waratah in 1882 while the Burnie to Waratah Railway opened in 1884 to carry the ore to the tin smelters in Launceston. Further down the west coast area, gold was discovered at Brown's Plains in 1877 and, during the following year, between Heemskirk and Waratah in the Corinna (Royenrine) area. Indeed the largest nugget ever found in Tasmania - at 7.5 kg - was found in 1883 at Rocky River in the Corinna area. Remine and Trail Harbour were the town and port built for the South Heemskirk tin mining boom in the first half of the 1880s. The road north from Remine branched towards Corrina and then north-east to Waratah. That was the route for mail delivery and for the first telegraph line in this area of the west coast. Further across, on the West Coast, other mining activities were also taking place. From 1877 to the 1890s (dates vary) mines opened at Renison (tin), Mount Lyell (copper), Strahan and Gormanston (gold), Zeehan (silver, lead) and Rosebery (zinc). The remote mining activities actually had little implication for telegraph line construction for many years. Remarkably, even the mines had no outlet by land for many years - and the mines had no road connections between them. Emmett describes the opening of a road as follows: "the Queenstown barriers came down first. It is said that on the evening of the official opening of the road there were only three sober men in Queenstown, and they would not have been sober had not the town's supply of beer given out". Finally telegraph lines were constructed over the mountains and through dense forests. The line from Waratah to Strahan was constructed in 1889 via Corinna and Heemskirk and it was extended immediately through to Gormanston (Mt. Lyell). Telegraph Offices were opened in Strahan in 1893 and in Gormanston in 1894 although that at Corinna (Pieman) did not open until 1898 (and closed 1905) and that in Queenstown opened in 1896. In 1900, two offices on the coast near Strahan and quite near to each other opened at Macquarie Heads and Regatta point. As demand for services in the general Corinna area decreased, an alternative line was being constructed to Queenstown through a link starting east of Waratah on the Wynard-Waratah line and extending south to Mount Farrell (1900), Rosebury (1898) and Zeehan (1899). Yet another line - linking directly to Hobart - was also being constructed to the west coast. It ran from Hamilton and Ouse, starting in 1890, through to Dee (1892) and then through some of the most difficult (albeit also most beautiful) terrain in the world. It is probable that the Queenstown office was opened when this line reached the west coast. 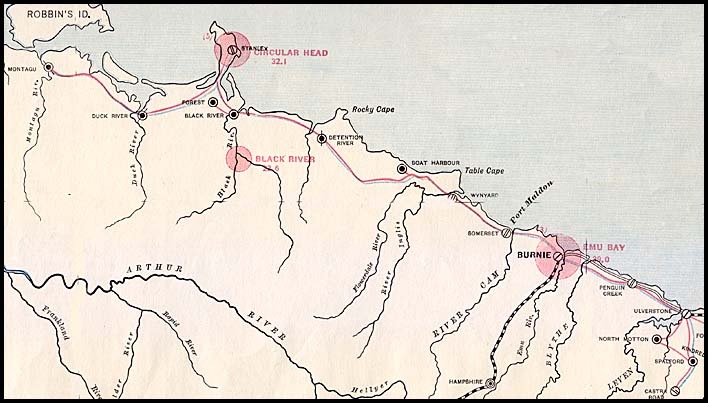 The route for the line is roughly that of the Lyell Highway today. DESTRUCTION OF TELEGRAPH WIRES AND INSULATORS. "It would hardly be credible, except for too much evidence to the contrary, that our population should contain so many so grossly ignorant as to find amusement in destroying those means of telegraphic communication on the extension of which every enlightened and public spirited colonist has been congratulating himself. On the North West Coast, which has been so long complaining of its isolation, the young sportsmen seem determined to keep that district outside civilization, for they amuse themselves by making targets of the insulators, while the Huon young barbarians seem so ignorant of the use of the unfamiliar poles and wire that they try to catch the wire to hang from or, where they cannot reach it, try its tension by striking against it with saplings, he being the hero of the game who can first break the wire. The inconvenience and loss that be thus caused cannot be realised by those who are guilty of such conduct; and witnesses of their doings would be but performing an act of duty to give information to the police, by whom some examples will have to be made. A permanent staff for the maintenance of the several lines would be so expensive that we must trust to the good sense and good conduct of the people and, where we cannot expect the latter as the result of the former, good conduct must be secured by the terrors of the law. It is to be hoped, however, as the north-west coast people and the Huonites got more accustomed to the sight of the telegraph, that their sense of propriety will make them shun a destruction which has not the excuse even of amusement". Telegraph offices in the North-west region.